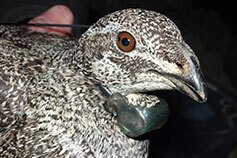 Ascertain pre–mine construction (before impact) demographic (age and gender specific individual and nest survival) and spatial (home range and movement) parameters for male and female greater sage-grouse (GRSG) at treatment and control study sites. ​​Utilize past research information (female and nest survival and movements) to supplement the before impact analyses. Ascertain post–mine construction (after impact) demographic (age and gender specific survival and nest survival) and spatial (home range and movements) parameters for male and female GRSG at treatment and control study sites. The greater sage–grouse (Centrocercus urophasianus) is a species of conservation concern. Intensive and extensive energy development within sagebrush (Artemisia spp.) communities in the western United States has raised specific concerns about the species’ conservation because of evidence linking demographic impacts to GRSG from active natural gas development. As such, significant financial resources have been allocated researching and mitigating the impact of fluid mineral development on GRSG. In contrast, there has been little attention directed towards investigating the demographic response of GRSG to other forms of mineral extraction such as surface coal mine development. Very little specific disturbance information exists that provides managers with effective mitigation measures for proposed mining activities (Little Collom Mine Expansion). Because of the potential impacts to GRSG by mining activities, managers had to use the best available science (lacking information about mine impacts) to establish avoidance and minimization mitigation measures in an effort to protect a strutting ground and breeding and summer habitat. Because of this lack of information, and to further understand the impact of the mining activities and the effectiveness of the mitigation measures, Tri–State Energy and Colowyo Coal Company is funding and working collaboratively with Colorado Parks and Wildlife on a research study. 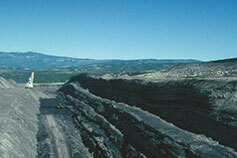 Our study is located in Moffat County, Colorado. We will capture male and female GRSG and will fit them with (very high frequency) VHF radio transmitters. We will also fit additional males with rump–mount harness PTT–Solar Argos/GPS PTT transmitters. An equal number of males and females will be marked in treatment and control sites. Apa, A. D. 2017. 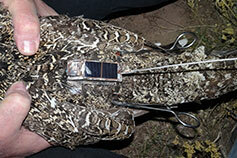 Greater Sage-grouse response to surface mine mitigation. Study Plan. Colorado Parks and Wildlife, Grand Junction, CO.
Apa, A. D., and A. Kircher. 2017. 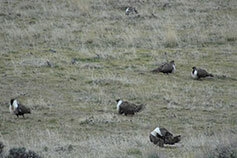 Greater sage-grouse response to surface mine mitigation. Progress Report. Wildlife Research Report. Colorado Parks and Wildlife, Grand Junction, CO.